Making a start on the Abbey coat - and a giveaway! My experience of coat making is pretty slim - I made one jacket last year through a combination of instructions from this book and making it up as I went along. I was pleased with the finished jacket: I liked the lining and the fit was OK, but the collar has never sat right, and looking back on it now, the fabric and buttons leave me a bit cold. They're both just so grey and drab. I've worn it out a couple of times but it's just not right. Making it was really good practise though, and as the cost of the entire jacket was only £5, the stitch-pocket side of me can rest easy at night. This time round, I'm using a proper pattern, lovely strokeable petrol-blue wool fabric and my bee-oot-iful polka dot lining fabric. I also sat down and read through the pattern several times, so that I could envisage exactly how this coat was going to be put together. And, wait for it, I made a muslin. The waist shaping and princess seams give it the fitted look I like, but it's still roomy enough to wear the odd cardigan or two underneath. Had to put this one in as my shoes look so lovely! On that basis, I think I'll sew it up as is, I think the fit is fine. To give an indication of sizing, I made up the muslin in a size 10, which more or less corresponds to my measurements, so I'd say that the sizing is pretty accurate. Jamie Christina patterns are well written and I'm happy that there's nothing that's intimidating about this make so far. Apart from buttonholes…. 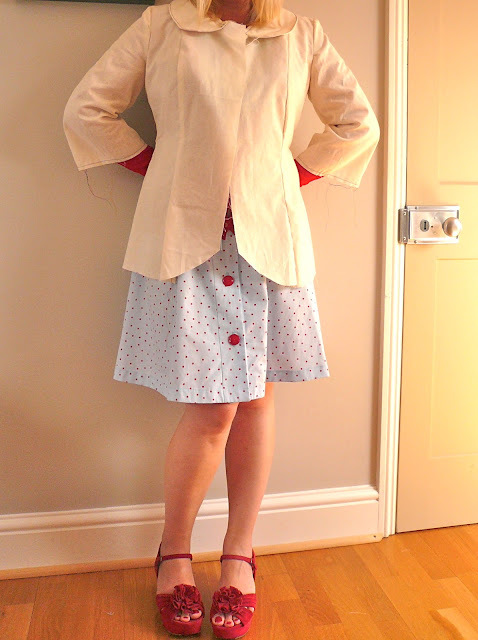 When I made my first jacket, I actually had to unpick three buttonholes that I'd sewn on wonkily. I'm worried that the layers of wool and interfacing may be too much for my machine, and the thought of having to unpick buttonholes on my lovely wool fabric makes my blood run cold. So I'm now debating whether to make bound buttonholes - the thought of which also makes my blood run cold, but Karen's look so lovely... It's not exactly a Sophie's Choice-style decision but I just can't decide. My tentative plan is to cut the coat out, and then practise both methods on the exact weight of fabric and interfacing I'll be sewing through. I'll need to make a decision soon though as bound buttonholes need to be made early in the process. If any experienced coat makers have their own buttonhole advice or stories, I'd be glad to hear them. All this coat talk has hopefully made you want to run off and make your own. Yes? No? Well before you do, read on, as you could be in with a chance of winning your own copy of the Jamie Christina Abbey Coat pattern. A copy of this pattern has been very generously donated by the lovely Annie at The Village Haberdashery. It looks like it's going to be a great pattern to work with and perfect if you're looking to make a coat this year. Way back in September (ahem), I bought my friend Emma some beautiful Liberty bird fabric for her birthday. The other part of her birthday present was a promise from me that I'd make it into whatever she wanted. Yes, yes, I know September was a fair few months ago, but I do keep my promises, and considering I'm pretty selfish with my sewing, the fact that I've made her anything at all is a minor miracle. Emma had a very clear idea of what she wanted: a camisole-style top, with spaghetti straps and a bit of flow to it. Oh yes, and a few tucks at the front. 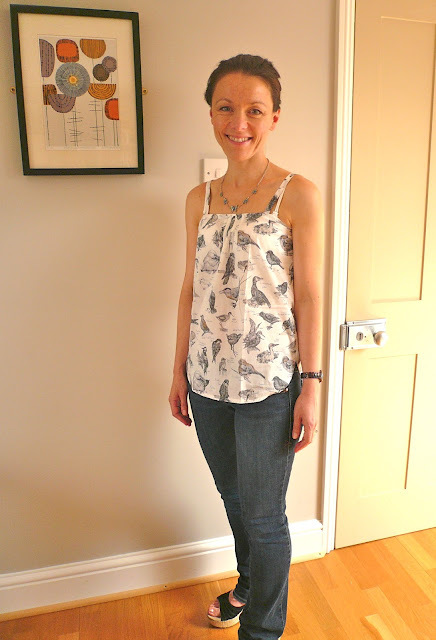 Luckily for me, Emma already owned a camisole top that was a perfect fit, so all I had to do was copy it. I won't go into the nitty gritty, but let's just say I think I'd really benefit from a pattern cutting course! Having to add extra fabric to the bodice front for the pleats, combined with my rubbish maths skills meant I had to redo the paper pattern several times. I'm sure if I knew a few simple techniques, I'd have saved myself a lot of time. I also made a muslin AND did a basted fitting on Emma to get the length of the straps right. I wouldn't do this for just anybody - Emma is a very good friend! All this extra effort (which I'd be very unlikely to put in for my own makes) was because this was a birthday gift and I wanted it to be perfect. 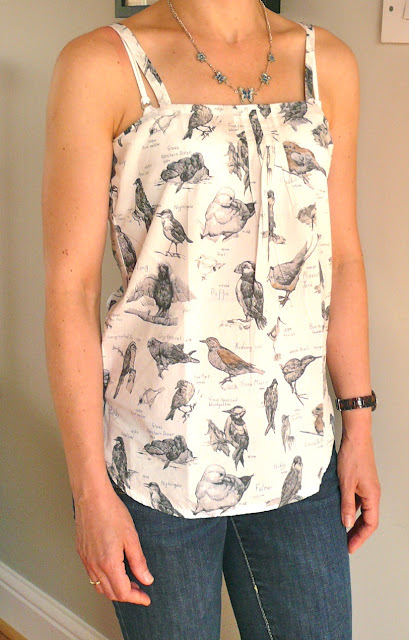 Also, the ornithology print is now discontinued, and I did NOT want to bugger up the cutting out stage and be faced with a bodged top and not enough fabric left to remake it. Can you imagine the horror?! 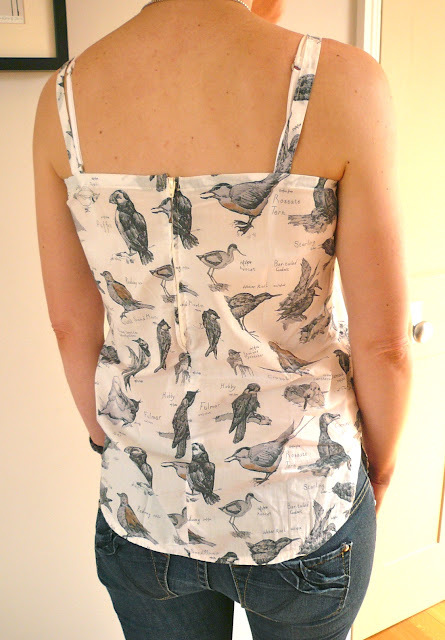 As well as adding tucks/pleats to the front (I used the technique from my Sencha pattern and it worked a treat), I made matching bias binding for the shoulder straps and as a facing for the top edge of the camisole. All that was pretty straight forward but I had a LOT of trouble inserting an invisible zip. I don't know why, as I've put them in countless times before without a problem, including a 22 inch one in my Peony dress (twice), so a mere seven inch stripling should have been a doddle. After I'd unpicked it twice, I started to get seriously worried about the effect all the unpicking was having on the delicate lawn fabric. So I made a very grown up decision to abandon an invisible zip and put in a plain centred one instead. Problem solved and it looks fine. Yes, it was a bit of a fiddle to get the top just right, but it's the perfect top for Emma and fits her like a glove. I'm happy to report she's worn it several times since I gave it to her. As she pointed out, it's the only one like it in the entire world!! I know everything we make is unique, but to be able to make somebody a birthday present that's both unique AND made-to-measure is pretty special. A pretty floral thrifted sheet. Making beautiful dresses from thrifted sheets has become Cindy's signature sewing style, this one being my favourite. With perfect timing, she's just written this guest post, which includes tips on sewing with them. Hoorah. Cindy even washed the sheet and trimmed the elastic edges off before she sent it to me. How's that for devotion to duty?! Very fine, polka dot cotton lawn. Oh, I can do so much with this.... Cindy's clearly been reading my blog! A darling, mid 1960's dress pattern. I think I'll go for view B as I like a short sleeve. There was even a little note included to say that the Chinese character on the front says 'flower', meaning florals are OK for this pattern. I love little personal details like that. A bunch of vintage bias binding and, wait for it...rayon seam binding. Stateside bloggers will probably be shaking their heads in bemusement reading this, but after seeing it on so many of their fabulous creations, I've always wanted to try it out and it's just not available over here. Well now I can. Really pretty royal blue and gold flower buttons. Coffee shop transfers - I'll be adding these to everything that moves thank you very much. The rules of the swap advised us to read our partner's blog and correspond with them to find out their likes and dislikes. This was one of the aspects of the swap I enjoyed the most. Cindy's blog was new to me, so it was fascinating to find out about her this way. It was good advice too, as I loved every single thing in my swap parcel. Thanks Cindy for being a fab swap partner and a total sweetheart as well, and thanks to Kerry for organising such a fun project. Ta-da. It's finished; it's a dress, it's got cherries all over it and it is indeed fabulous (well I think so). I'm just a little bit overjoyed with how this dress turned out, the pairing of fabric and pattern (V8727) seem to have worked pretty well. So, what's to report? I only ended up making a couple of changes to the pattern. I added half an inch of fabric at either side of the outer halter top. This was to disguise those unsightly bits of (ahem) fat (for want of a better word), that seem to appear between your underarm and your bra strap. Is there an actual name for it? You know what I mean though don't you?! This seemed to do the trick, and I actually like the extra coverage. I also added small darts on each bodice cup to give more shape - thank you Mrs C for that tip! The only other change I made, was to take in the side seams of the skirt by half an inch and the back side seams by about an inch and a half in total. What I should have done was cut a size 14 top and size 12 bottom, but I was too lazy to make a skirt muslin so there you go…. easy to sort out though. I could have fitted the dress a bit tighter all round, but I'm keen to wear it as much as possible, and I think being able to breathe and walk and talk at the same time will make it that bit more wearable. The dress is fully lined with white silk cotton which is such a lovely lining to wear next to the skin. There's actually quite a bit of hand sewing that's gone into this make, mostly sewing the lining to the zip and the bodice lining to the skirt. 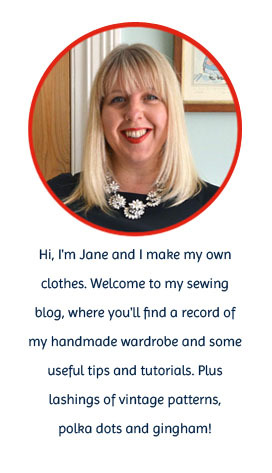 There was a very interesting discussion on Karen's blog yesterday about hand sewing. I haven't changed my stance, I'm still firmly in the "hate it" camp, but I will say I almost enjoyed hand sewing the lining on this dress. Perhaps the more of it you do, the less devilish it becomes? As a final. flirty touch, I added a white lace trim from Walthamstow market to the hem. Overall, the pattern was pretty easy to navigate but I probably wouldn't recommend it to an absolute beginner. There's a lot of to-ing and fro-ing with lining and dress fabric and I nearly lost my way a couple of times. 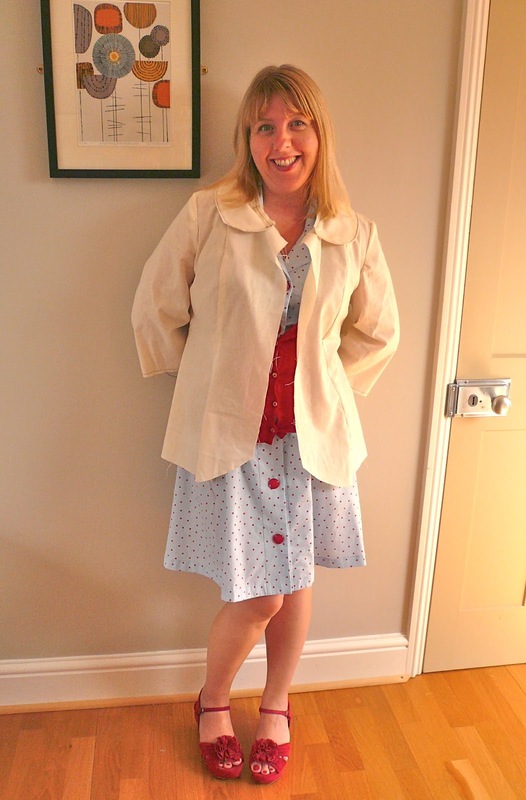 It was a joy to make it though, and I'm satisfied that it manages to combine elements of the two Marilyn Monroe dresses that originally inspired me (pics of them in this post). Weather wise it's not going to get much better in the UK. After the wettest June for over 100 years (!) my poor parents up north are having to brace themselves for a month's worth of rain in one day. Good job I don't live up north any more is all I can say to that… But, this is the sort of dress I will wear in the rain just because I feel like it. It's that fabulous!